Boo! I have to admit that Halloween and the 24 hour Fear Fests on TV got me thinking about why people watch this stuff --what is the great attraction--and how does this transfer over to the world of travel. I will admit that I can’t handle movies such as Halloween or Friday the 13th, and really, the scariest DVD in my collection is Abbott and Costello Meet Frankenstein. But when we were kids in the 1960’s, it was a real treat when our Mom took us to Buffalo for the annual shopping spree and then we would return across the border to spend some time in Niagara Falls. 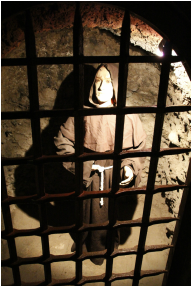 High on the agenda was Madame Tussaud’s Wax Museum and especially the torture chamber, where wax figures were depicted in various stages of enduring medieval and colonial methods of torture to induce confession, repentance or punishment. And I remember when I visited London for the first time in 1967, we headed off to their version of Madame Tussaud’s and were disappointed that the torture chamber content was so much more subdued than the gore we saw at the Niagara Falls venue. There is a long history relating to man’s fascination with death and torture and evil deeds. Some suggest that the concept of a ‘hell’ accounts for part of it where people sought to understand what exactly they would experience if the gates of heaven were not open to them, thus laying the path for a more righteous life. While there are, no doubt, countless theories about “why’ the fascination, there is no question that Dark Tourism is one of the off-shoots. Even in cases where the macabre is treated in a humorous fashion (i.e. the so-called ghost tours that are offered after sundown in cities around the world and tours that humorously portray terrible events, whether it is the Jack the Ripper Tours in London or the assassination of Thomas D’arcy McGee in Ottawa), this is lumped into Dark Tourism. More egregious examples include sites such as Auswitch-Birkenau in Poland, which was one of the more horrific concentration and extermination camps used by the Nazis. Described on their website as one of the most popular and most visited museums, the displays use life-size dummies and re-created devices to depict the torture techniques used during the Spanish Inquisition, which of course affected not only Spain but the Spanish colonies in the 16th century and onward. • The JEATH War Museum, Kanchanaburi, Thailand. “JEATH” is an acronym for Japanese, English, Australian, American, Thai and Holland. The museum depicts the terrible conditions under which the Japanese forced the allied prisoners of war to build the Thailand Burma rail line (also known as the Death Railway) from 1942 to 1943. 12.000 of the 60,000 allied prisoners died. The movie Bridge over the River Kwai covers some of the cruelty and brutality used against the allies but a visit to the Museum itself is what I call ‘nightmare material’. • The Tuol Sleng Genocide Museum, Phnom Penh, Cambodia. Tuol Sleng is the site of a former high school that was turned into Security Prison 21 by the Khmer Rouge from 1975 to 1979. The displays inside have not been hollywoodized or re-created, in order to testify to the unbelievably cruel torture and confinement techniques used to extract confessions from Cambodian nationals, before taking them out to the Killing Fields which lie just outside of Phnom Phen. Most tourists leave Tuol Sleng in stunned, shocked silence. • The Colosseum, Rome, Italy and El Jem, Tunisia. The popular entertainment of the day when wild animals were elevated through secret passages to the surface where they would face a legion of gladiators and fight to the death; or gladiators were pitted against each other. Despite the attitude that this is ancient history, Colosseums are the sites of mass deaths, religious persecution and displays of cruel power by those in authority who gave the thumbs up or thumbs down to indicate the fate of the participants. • Robben Island Museum, Cape Town, South Africa. You may be surprised to see this World Heritage Site included in the list, as Nelson Mandela himself encouraged people to visit the facility where he was incarcerated for18 years. The packed tours arrive by Ferry and walk the short distance to prison where tourists are assigned to a guide who was once a prisoner on the island himself, and they walk through the various areas to see the conditions under which the prisoners were kept. • Kilmainham Gaol, Dublin, Ireland. • Don Jail, Toronto, Canada. Only open to visitors on a few occasions in the past, Toronto’s Don Jail featured ‘jail architecture’ from the turn of the 20th century, as well as a recreation of the indoor gallows that were used up until 1962, when capital punishment was abolished in the country. The most popular part of the tour was, of course, the gallows. So again, I ask what is the attraction—what is the fascination—and suggest that Dark Tourism is not for all your clients but if included on a list of possible sites/venues to explore when on holiday, you may be surprised at the popularity of ‘dark tours’. After all, can your clients travel to Romania without some exposure to the cruelty-spree of Vlad the Impaler, the inspiration for the Dracula character? Can you visit Mongolia and not learn about the exploits of Genghis Khan (His face, on T-shirts is available for sale almost everywhere in Ulaanbaatar). Are all these people sick? I would not come to that conclusion. I suggest instead that it is singularly or a combination of voyeurism, education, the traditional fascination with death and various psychological motivations that are beyond the scope of this article. However we do know that psychographics is the study of why people travel to various places and attractions and surely Dark Tourism is a contender for this category. The travel professional does not always need to know the specific reason why the client wants to travel to a place, as much as what kind of activities or attractions they want to include in their travels. (To clarify, your client may want to visit Israel for tourism but if they request a stop at Yad Vashem on their itinerary—which is the Museum dedicated to documentation, research, education and commemoration of the Holocaust—you don’t need to ask why they want to go to that particular museum). I did mention the word ”education” a few times in speaking about Dark Tourism. I kept thinking of an article I wrote a while back on Poorism, whereby travellers pay a guide to visit the poorer areas of a city, for example the slums of Rio in Brazil. As with Dark Tourism, there is a debate as to whether this is voyeuristic (i.e. getting pleasure from seeing how others less fortunate than you. live) or sensational (i.e. here are my photos of poor people—so therefore I get extra ego-points for having risked my safety to get them—what an adventurous person I am) …or educational.(i.e. I want to learn about other people and cultures—past and present—so I can become a better person and educate others in order to ‘understand’. Those who imbibe in Dark Tourism must decide for themselves how to resolve or communicate what they see along the travel route. Those who pursue a course of education are applauded for putting aside their travel-creature-comfort persona and doing something out of the ordinary in order to learn and possibly change their perspective about the country or of the people, and how past events may relate to current situations. Last summer, friends told me to spend my time in Guatemala and to forget visiting El Salvador. The reason was that there were very few, if any, colourful native folk art traditions in El Salvador and Guatemala was ripe with photo opportunities. While there we learned of La Matanza—the slaughter that took place in 1932 when 30,000 indigenous people were killed, which explains why the country does not have a strong native tradition compared to that of Guatemala. Education, through the portal of Dark Tourism can really open your eyes and allow you to see the light. For travel professionals, Dark Tourism may not be something in which you choose to specialize but it is a legitimate travel niche market that you need to know about and understand. Time to enlighten yourself!